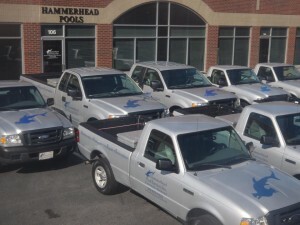 About Us | Hammerhead Pool Services, Inc.
Hammerhead Pool Services has over 40 years of combined experience. We can provide a full range of maintenance, renovation, repair and staffing services. Hammerhead offers everything you will need in preparing and maintaining your pool in a pristine condition. Our certified staff will ensure that your pool is properly maintained throughout the swimming season. Our pools are in constant compliance with all regulations and that all pools are properly winterized. Our renovation and repair division can offer assessments and equipment repair on all ranges of pool motors, pumps, salt systems, filters and plumbing repairs. With free estimates and a 100% 1 year warranty on all workmanship, we are confident in meeting all of our customer’s needs. We strive to provide a positive work environment, where committed individuals can fulfill their potential and in turn deliver unmatched quality service to our clients.